Two weeks ago, I headed to the Himalayas for the adventure of a lifetime in the Kingdom of Bhutan. 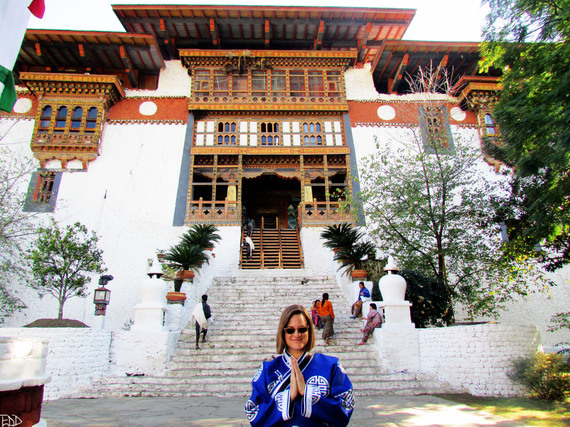 Since I was invited to speak at the Royal Palace on disability in Bhutan and Oman at the International Conference on the Gross National Happiness Index, I knew I was in store for a travel experience unlike any other. 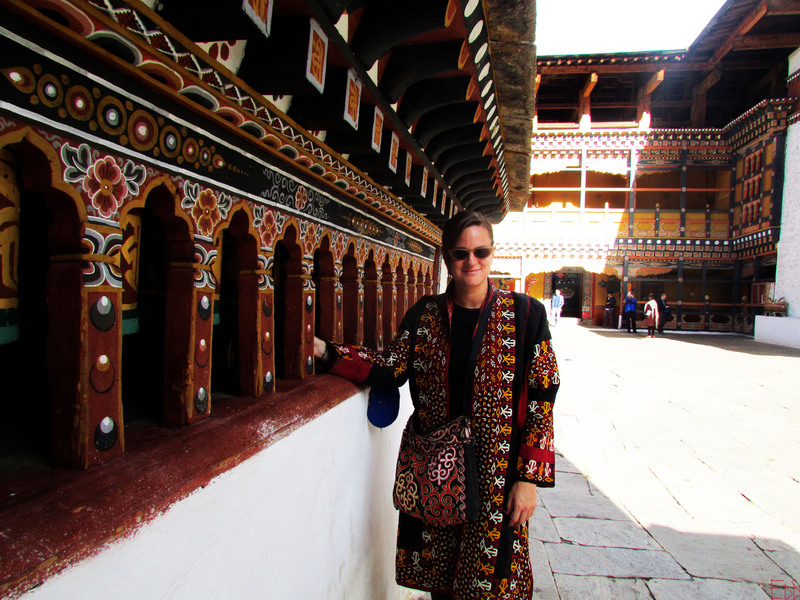 Flying to Bhutan is half the fun. 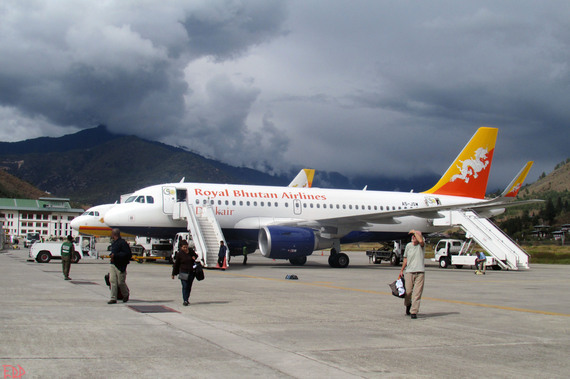 Only two airlines -- Druk Air and Royal Bhutan Airlines -- fly into Paro. On my flight from Kathmandu to Bhutan, I marveled at the majesty of four of the highest peaks in the world (Mt. Everest, Cho Oyu, Makalu, and Kanchenjunga), before our skilled pilot dipped our wings between Paro's steep peaks -- mere feet from the tree line. Touching down in Bhutan is no easy feat -- since it's considered one of the most dangerous landings in the world. Upon exiting the airport, I was greeted by a large sign that read: "WELCOME TO THE LAND OF THE THUNDER DRAGON." 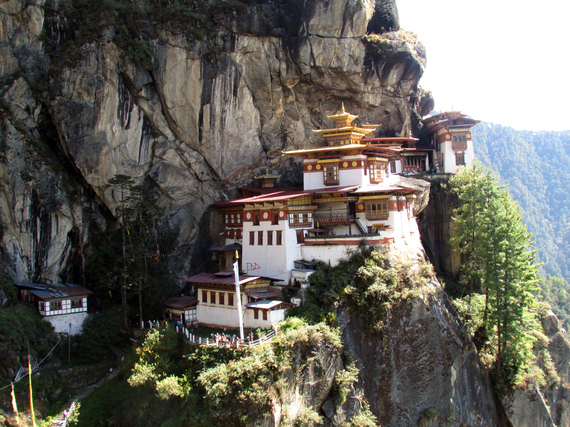 Nestled between India and Tibet, the remote and breathtaking Kingdom of Bhutan opened its borders to tourists in 1974. This year, Bhutan is celebrating Visit Bhutan Year to honor the 60th birthday of its fourth king, His Majesty Jigme Singye Wangchuck, who created Bhutan's "high value, low impact" tourism model and its gross national happiness index -- privileging well-being and happiness over profit and the GDP. 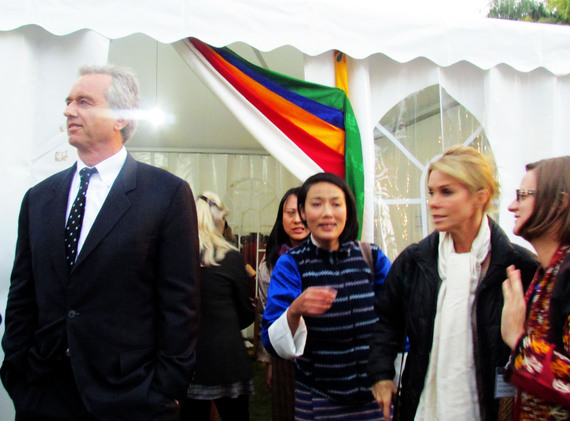 In 2006, he abdicated in favor of his Oxford-educated 26-year-old son, His Majesty Jigme Khesar Namgyel Wangchuck, who presided over Bhutan's first parliamentary elections in 2008 in the country's transition to democracy. Hungry from my overnight travels, I grabbed a delicious quick lunch at Yue-Ling restaurant with my travel guide. 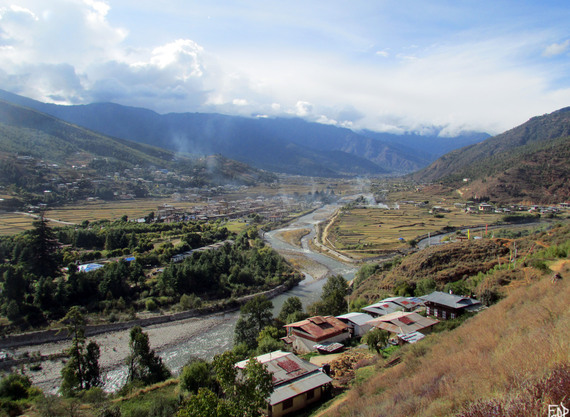 Since independent travel to Bhutan is prohibited, I booked a personalized trip through Pelden at Bhutan Travel Club, a soft-adventure company specializing in trekking, cycling and cultural holidays in Bhutan. Powered by pumpkin curry, my guide and I took a short hike to Paro Dzong -- a beautiful fortress and Buddhist monastery where scenes for Bertolucci's Little Buddha were filmed. Since I haven't seen autumn in several years (due to living in Lebanon and Oman), it was a delight to re-visit the reflective season of fall while surrounded by colorful Buddhist art and whirling prayer wheels. When I finally retired to my hotel for some much-needed rest, I was greeted by a traditional masked dance performance -- before sitting down to enjoy a festive Halloween feast. 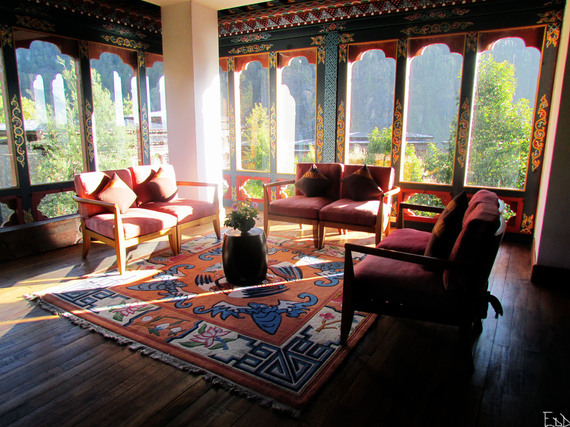 Zhiwa Ling, the first and only wholly Bhutanese owned hotel to receive a 5 star rating, is without a doubt my favorite place to stay in Bhutan. 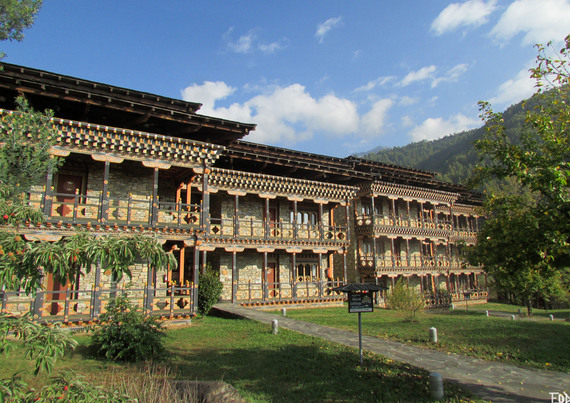 Cradled in the heart of Paro Valley, the hand-carved wooden cornices and masterful stonework of the hotel's quaint cottages conjure the ambience of a traditional Bhutanese guesthouse. But my favorite feature of the hotel is the one-room temple built into the second floor of the hotel -- made with 450-year-old timbers from the famous Gangtey Monastery -- where I could focus my mind with meditation in peace and quiet. For my first full-day in Bhutan, I arose early to make the steep climb to Tiger's Nest -- the legendary Buddhist monastery precariously perched on a precipitous cliff 900 meters (3,000 ft) above Paro Valley. 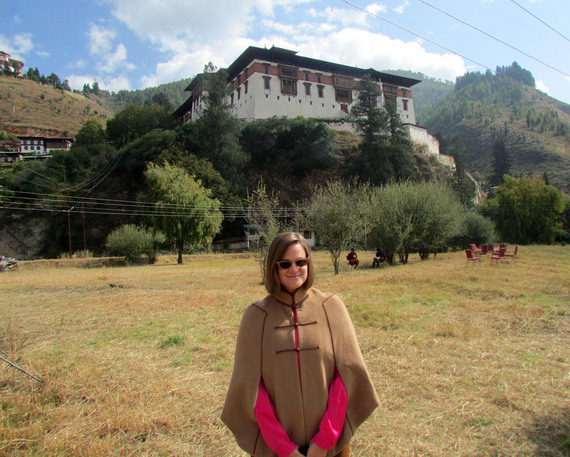 While most tourists usually make this mystical monastery their last stop -- after they've had a week to acclimate to the altitude -- I didn't want to waste any time in making the spirited trek. Due to a long-standing injury, I trained for three weeks prior on a staircase in Oman to build up my strength. 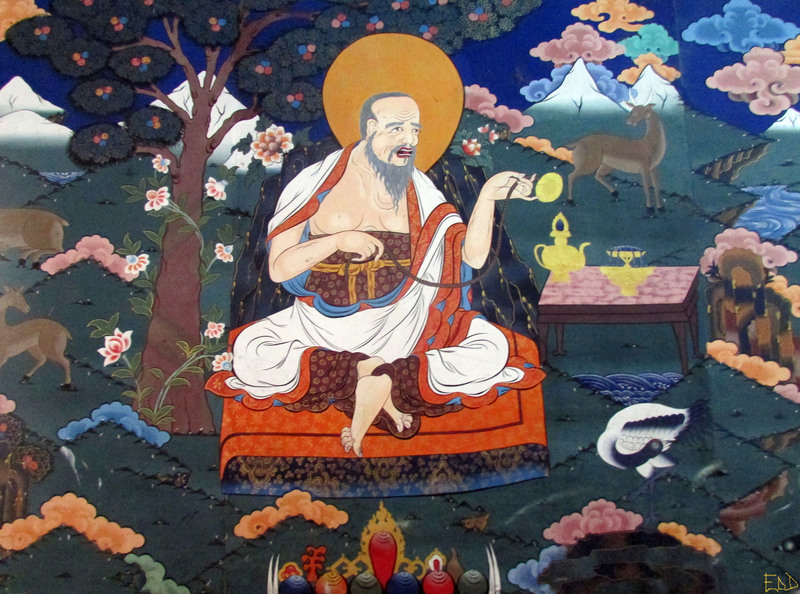 Bhutanese believe that the 8th century Buddhist master Guru Rinpoche (the founder of Tibetan Buddhism) flew on the back of a tigress to the top of this mountain, where he meditated in a cave for three years, three months, and three days. For me, my pilgrimage to Taktsang Monastery was to be a spiritual ascent too -- in proving to myself the power of the mind over the body. With the help of a walking stick (and early morning meditation in my hotel shrine), I set off with my guide from the base of the cliff -- to the clanging of a prayer bell powered by the rushing current of a nearby stream. As we wove through the blue pine trees and prayer flags waving in the wind, my guide and I traded jokes about ever-elusive enlightenment, and stopped occasionally to catch our breath and admire the view. 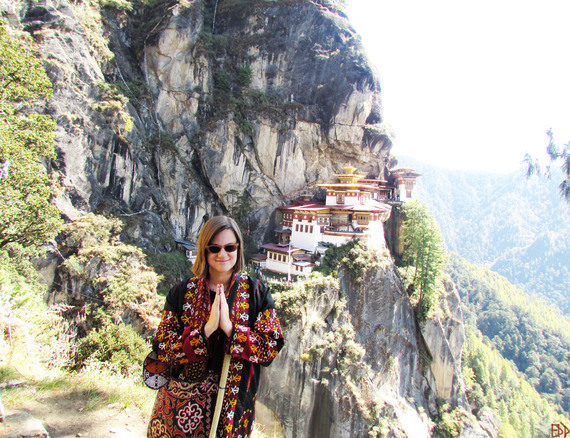 When we passed by the final 200-foot waterfall and reached the inner sanctums of Tiger's Nest, its serene shrines and gold statues lit by flickering yak butter candles, I felt a rush of ecstasy and gratitude for having completed the long journey. For a moment, anything seemed possible. But the descent proved more difficult -- what goes up, must come down -- and suffering tends to flourish in the absence of a galvanizing goal. 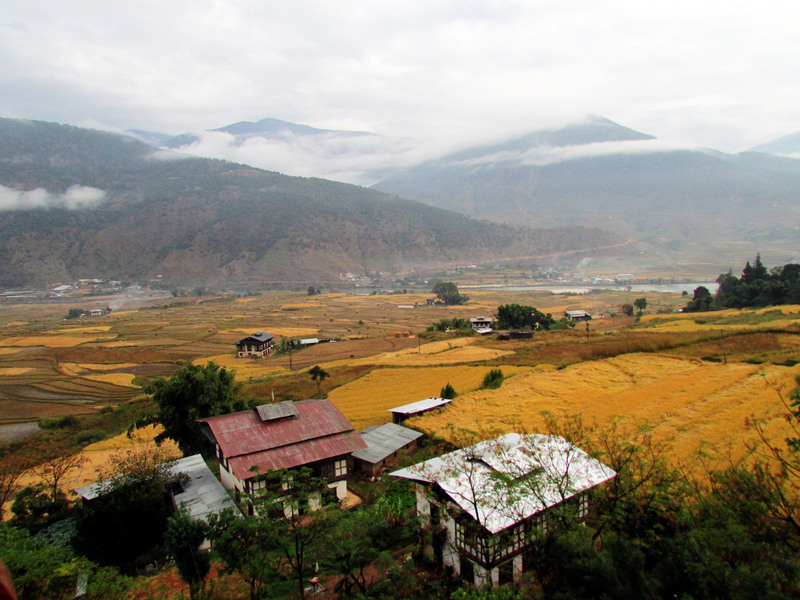 On our scenic drive through the countryside to the capital city of Thimpu, the pain and exhaustion from our six-hour hike began to fade. Pulling into the capital at sunset, my guide and I went straight to the giant 50 meter tall Buddha Dordenma statue overlooking the city. ​When we arrived at Taj Tashi Thimpu hotel, I was greeted by a monk who blessed me with saffron water and sutras. 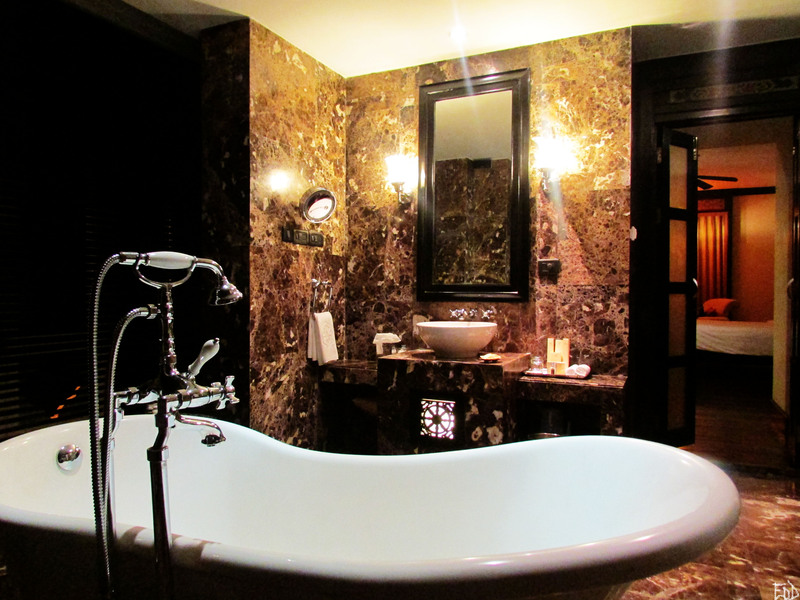 After enjoying a candlelight massage and traditional Bhutanese cuisine, I climbed into the warm hug of my suite's bathtub to soak in the success of an intrepid day. 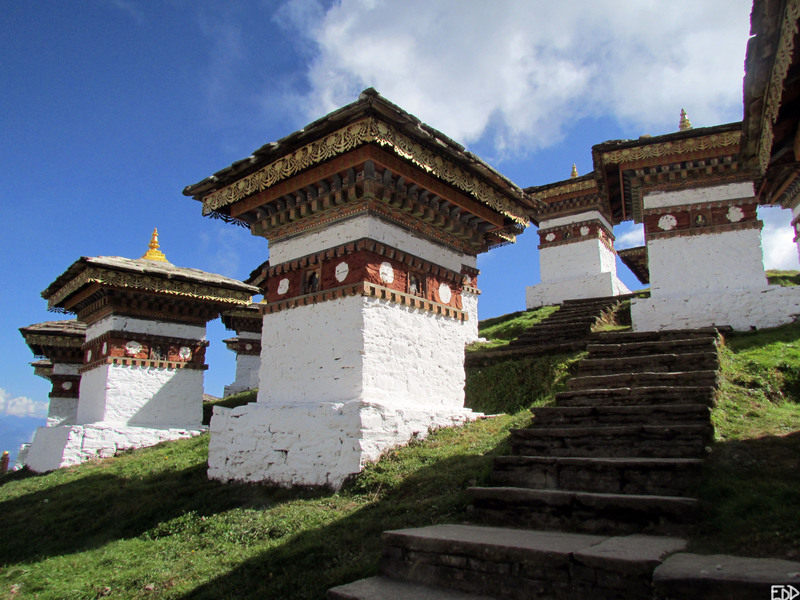 The next morning, on our drive to Punakha, we stopped at Dochula Pass to explore the 108 stupas erected in honor the victory of the Bhutanese army in the 2003 war of Southern Bhutan (each one contains effigies of Buddha and religious texts). 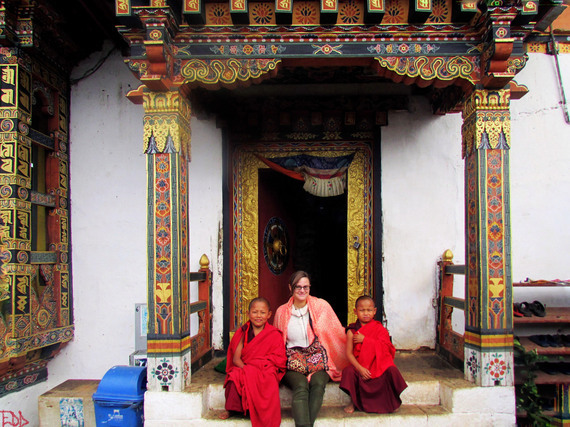 When we arrived at Sangchen Lhuendrup Choling Nunnery in Punakha, I had the opportunity to interview a young nun about her recent transition to the cloistered life, and she asked about my unusual private audience with His Holiness the Dalai Lama. I became officially blissed out in Bhutan the moment I laid eyes on the enchanting entrance to Punakha Dzong. 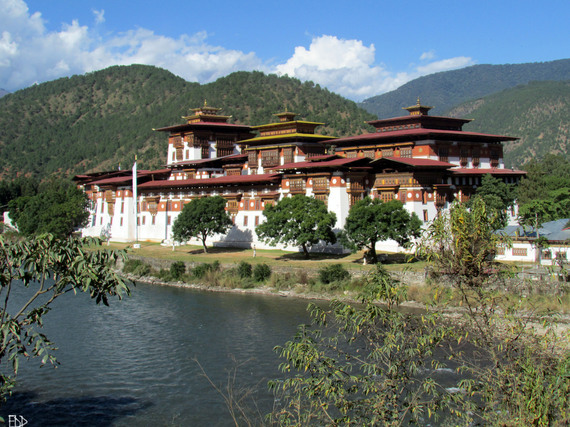 Known as "The Palace of Great Happiness and Peace," this architectural wonder served as the headquarters of the Bhutanese government until 1955. 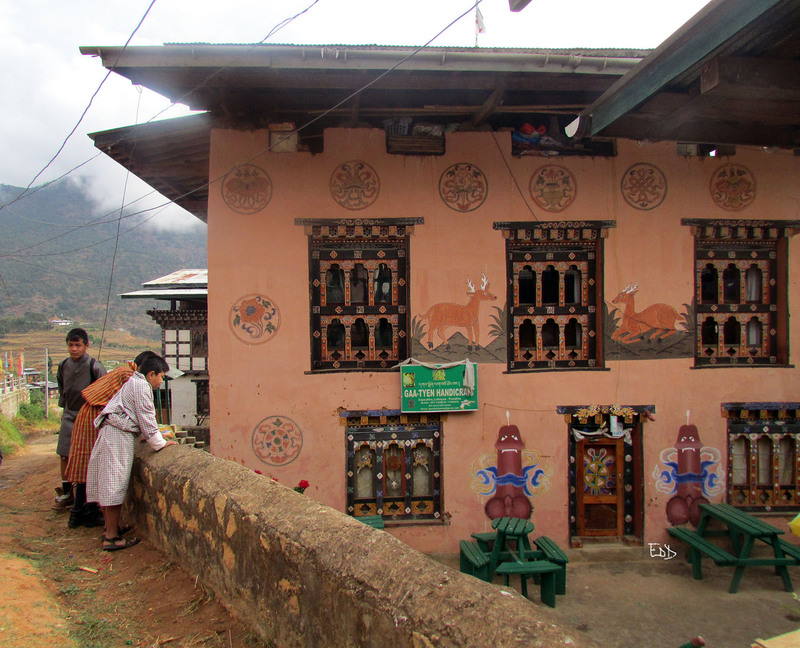 It still contains revered relics of Buddhist saints -- like Pema Lingpa -- from the southern Drukpa Lineage of the Kagyu school of Tibetan Buddhism. 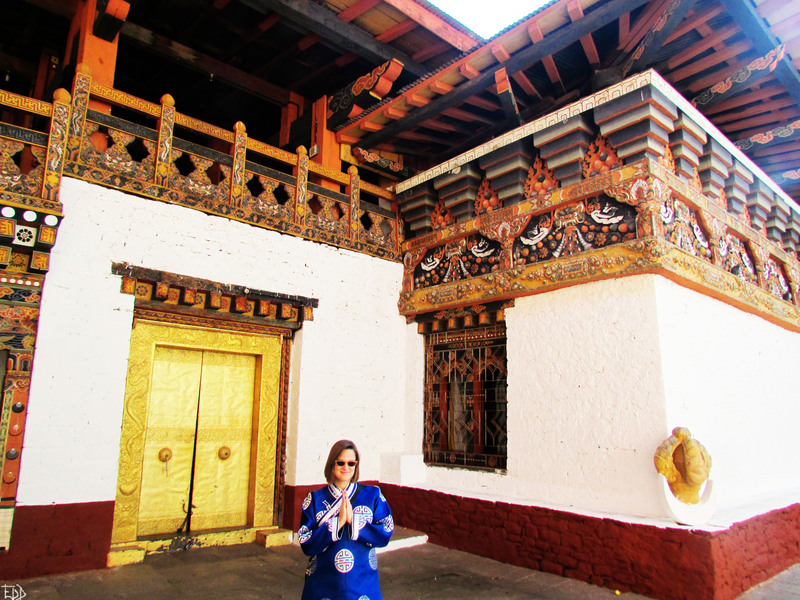 From the gilded doors of Punakha Dzong, we journeyed onwards to Lobesa, a spiritual town renowned for "the "mad" Buddhist saint, Drukpa Kunley, who instructed his female followers with his "thunderbolt of flaming wisdom." As a result, Lobesa is the center of "divine madness" and phallus worship in Bhutan. The next morning, I awoke to the tranquil tapping of rain on my window at Hotel Lobesa -- a lovely little abode overlooking the valley. 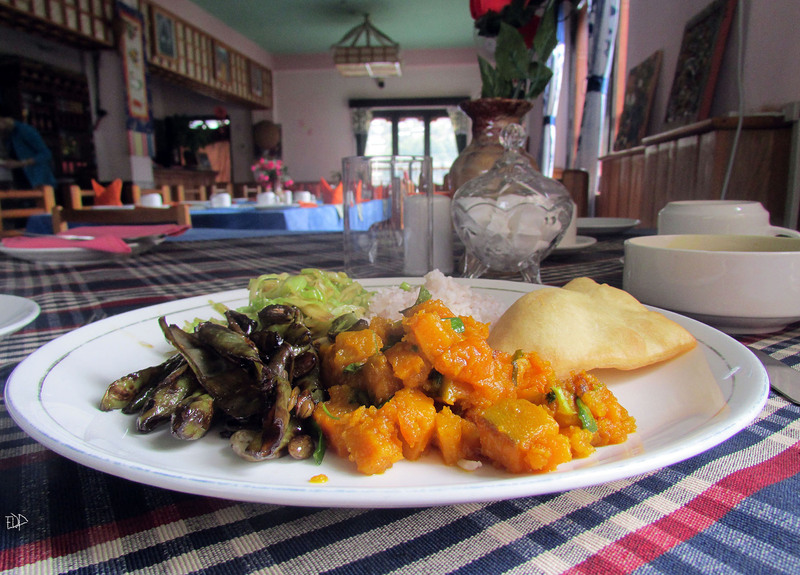 Over a delicious breakfast, I practiced speaking Dzongkha with my guide and the hotel's patient and friendly staff. 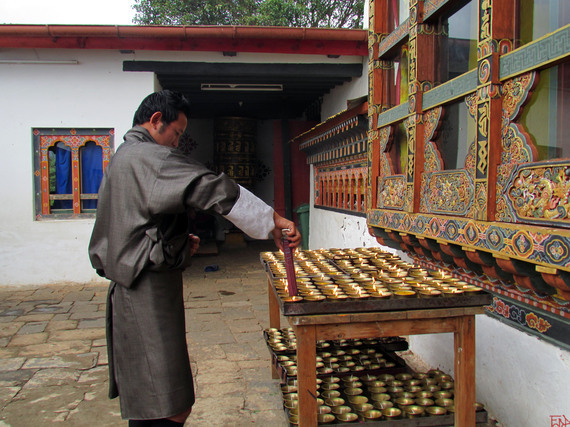 "Today is the day of Buddha Descending," my guide said, "a national holiday to celebrate when Buddha came down from heaven to help others reach enlightenment -- so we must first buy incense and offerings to take to Chimi Lhakhang Monastery." Outside the monastery, my driver Kilay lit up a bouquet of incense sticks and handed them to me to carry inside. In front of the altar, a stream of local people paid their respects to the golden statues of Buddha and the divine madman, while monks of all ages sat on the ground and chanted scriptures through the thick haze of incense. Offering me a blessing, one monk recited a short prayer and tapped me on the head with a long wooden phallus -- the sacred relic of the temple. I didn't see that coming -- but I should have! Putting my shoes back on outside, I tried soaking up some wisdom from a pair of friendly young monks. "Do you believe in the yeti?" I asked my guide, as we strolled back to the car through small clusters of traditional houses. "Of course," he said, "but no one has seen the yeti for decades -- our grandparents, however, once enjoyed many yeti sightings in the mountains." On our drive back to Paro for the International Conference on GNH, I kept hoping that I would spot the first yeti in years. In my speech at the Royal Palace the next day, before an audience of scholars, activists, monks, students, and staff from the Center for Bhutan Studies & GNH Research, I discussed how Bhutan and Oman have advanced disability rights, and how they might further expand care, access, and inclusivity to people with disabilities in both urban and rural areas -- especially people with mental illness. 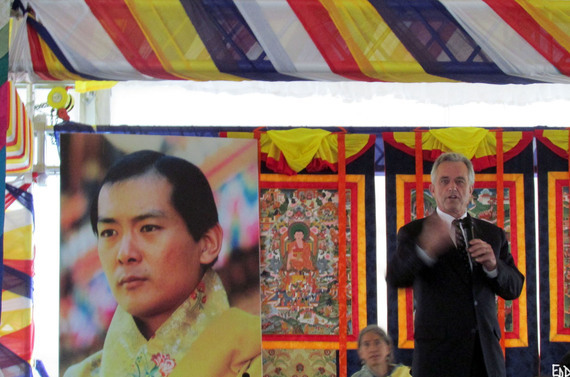 My talk brought together disability studies, spirituality (Buddhism & Islam), traditional Tibetan medicine, shamanism, and human rights. To my surprise and delight, I had the honor to speak one-on-one with His Majesty, the Dragon King of Bhutan, about disability, and to commend Her Majesty Jetsun Pema, the Dragon Queen (who is currently pregnant with the royal heir), on her patronage of the Ability Bhutan Society and her efforts to raise awareness about disability through "Special" -- a compelling documentary which she produced. At the conclusion of the conference, Robert Kennedy Jr. spoke with passion and urgency about the important role that the environment plays in our work, health, and identity. After all, it was his father, Senator Robert Kennedy, who noted the implicit dangers of the United States prioritizing the GDP over more "worthwhile" indicators of progress: "It measures neither our wit nor our courage, neither our wisdom nor our learning, neither our compassion nor our devotion to our country, it measures everything in short, except that which makes life worthwhile." 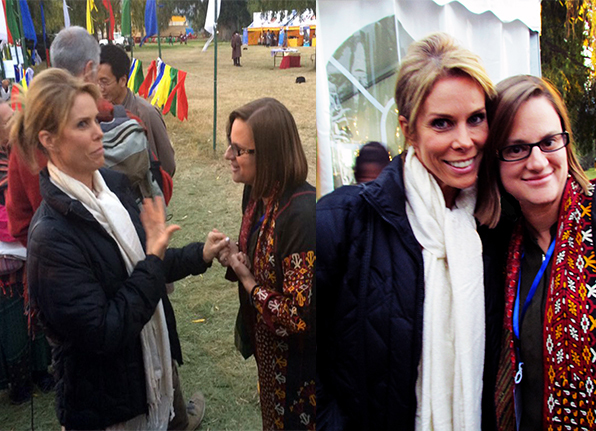 After Mr. Kennedy's talk, I had the opportunity to speak with his talented and hilarious wife, Cheryl Hines, the beloved star of Curb Your Enthusiasm who is a disability advocate herself. Laughing in the Himalayas with one of my favorite comedic actresses in an improv all our own, I realized that we had all forgotten to acknowledge one of our greatest natural resources for happiness -- comedy. Organic and in abundant and untapped supply, the world could definitely use more of it. Flying back over Mt. Everest, when it was time to leave beautiful Bhutan behind, I remembered some wise words His Majesty had shared with us over tea. He said: "I think it was George Bernard Shaw who wrote: 'The reasonable man adapts himself to the world, but the unreasonable one persists in trying to adapt the world to himself. Therefore all progress depends on the unreasonable man.' So I hope all of you here at the conference are feeling a bit unreasonable." 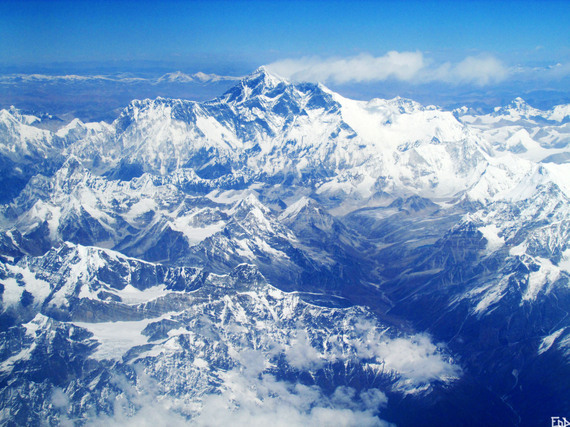 Glancing down at the "roof of the world," His Majesty's words echoing in my mind, I wondered how different the world beneath the clouds might be if we could all get a little more "unreasonable," and make the happiness and health of all sentient beings (and the environment) an individual and global priority. Maybe I was just feeling dreamy after an oxygen-deficient week in the high altitude of the Himalayas, or maybe I was genuinely contemplating a goal that would remain just as urgent and possible after my descent back to earth.